I am under the impression That THE old gen 2 lamps also works with the new smartlink remotes. So if you buy a new gen 2 you probably can use That remote with THE old gen 2. Still not with the gen 1 tho. Confusing indeed. I hope THE new one gets more popular so somone with a zigbe sniffer gets his Hans on it and reverse engineers THE protocol. Will you be working on a new shield for the gen 2/smartlink protocol? The Gen1 protocol was unencrypted and hacked by sprite (thanks Sprite !) by eavesdropping on the communication between the MSP430 and the CC2500. The Gen2 seems to be using Zigbee transport with encrypted payload which may be much much harder to decode. I’m preparing some posts about the internals of the remote and adapters.And there are some things i’d like to look in to like the communication between the CC2530 and the Cypress touch controller, and I’d like to spend some time looking at the actual over the air trafic between the devices. I for one would be very interested in some Gen2 hack: I don’t have any experience with Arduino (and it’s been a while since I’ve soldered anything at all) but I’d definitely try to implement something like that. @Arturex: Nice find. I m afraid that just sniffing packets might not be enought tho because of the encryption. I am reading up on vulnerabilities in Ti’s z stack like http://travisgoodspeed.blogspot.com/2009/12/prng-vulnerability-of-z-stack-zigbee.html. But im a high level programmer that hardly knows how to program a microship pic, so its prety hard for me. Hi guys you are doing great things here! Can someone please help me with some advice ? I want to use one of my livingcolors gen 2 lamps to drive (via an amp) a strip of rgb 5050 leds that are fitted in the coving in my living room. So i just need to know where i can tap into it….. I am looking for a an android app that controls the Philips living color light Gen2 (via Smartlink). It would be very nice to control the lights via app where I could draw my room in 2D place my light and control them separately or together or set an automatic time control. In the morning I could use the Living color to wake me up like the Philips Wake-up Light HF3471 but with “real sunrise”… One thing more is if I could place a control box at my home where my automatic time controlling is set the light would turn on an off even if I am not at home (safety light). I have a lot of ideas how the app could look like and what it all could do. I tried to place my idea at philips but they are not interested. Could you develop such an app? You could even sell such an app to Philips. Thank you for your reply. -ZigBee exchanges keys are transported unencrypted, if there is a new device. -> Sniffing. -If there are preconfigured keys, maybe a readout of the CC2530 would reveal the key. -If all this fails, maybe using such a chip and simply imitate the wanted signals. -Or talk to the guys @philips maybe they will give information about the lamp protocol. The keys are hardcoded in the device and not exchanged. The code in the CC2530 cannot be read once written, only erased. Simply imitating signals probably won’t work because of the per session or per peer keys. As for the last one, Philips have announced wifi – zigbee remote controllable lamps this week. With an app and web interface. And it is a really interesting product ! I should do a post about it soon..
Got the HUE set, very nice :) Shame that you can’t hookup the Gen2 lamps LivingColor and LivingWhite to it. Some network sniffing revealed some interesting communications from the bridge to the google cloud. Okay. I’m jealous now. Have you tried controlling a LivingWhites or LivingColors Gen2 ? Ivo, tried it with a brand new unused bulb and the long shaped Gen2 controller. but None of the Gen2 controls seem to work, no on/off no brightness or color changes. Well don’t try it… unable to add the Bulb into my Hue network :( it doesn’t show up when ‘searching for new bulbs’ in the App. The Gen 2 Lamp used was ‘registered’ with a remote. There is no (I) button on the bridge to ‘pair’ a Gen2 lamp. How can one reset a Gen2 Lamp and / or Hue Bulb to Factory default (without taking it apart). 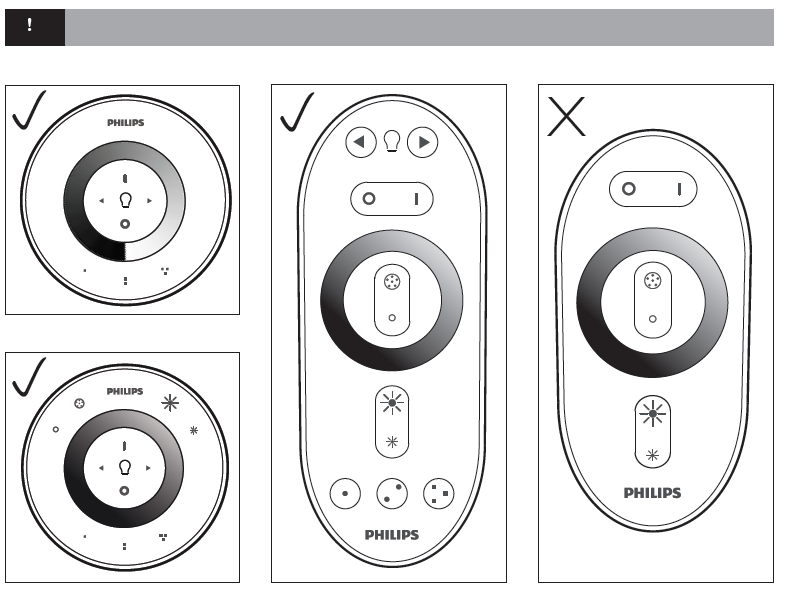 I have the same experience as flos.. Don’t try to connect your bulbs to a SmartLink remote control! If you do, they can’t be managed via the bridge any more. Never, because there is no known way to ‘unregister’ them from the remote. Power down and up won’t work: the bulbs remember their remote and stay paired with it. How can I connect my LivingColors to hue? Reset the remote control to factory defaults: remove the back cover of the remote control and insert and hold a paperclip in the little reset hole inside the remote (remove back cover) until you hear a beep. Add each LivingColors lamp and hue lamp to the remote control: bring the remote close to the lamp, then press and hold the “I” button. The lamp will flash 3 times. Hold the “I” button until you hear a beep from the remote; the lamp will shortly flash in green. It is now connected to the remote Control and will turn to its last “on” setting. Check if all the lamps can be controlled using the remote control. Reset the hue bridge to factory defaults and clear the Zigbee network settings: press the link button on top the bridge and bring the remote close to the bridge, then press and hold the “I” and “Scene 1” (.) button on the remote control until LEDs on bridge start blinking and the middle LED turns off. Copy the Zigbee network settings to the bridge: bring the remote close to the bridge, then press and hold the “I” button. The LEDs on the bridge start blinking. Hold the “I” button until you hear a beep from the remote; The middle LED lights up on the bridge. Start the app and follow instructions. 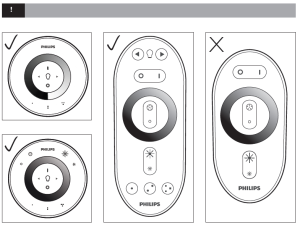 Philips support didn’t anwser yet on how to reset a bulb. Done! it worked well with the round Gen2 controller. Now got all my smartlink devices into the bridge. After the initial pairing setupetc. you can add new devices. Go with the remote to the Smartlink device and Pair it (happy sound and blinking). Press the button on the bridge. Hold the Remote close to the bridge and press and hold (I) until the bridge copied all the data of the remote. The hue protocol is open so i expect lots of apps to appear soon. At first, I couldn’t think for the life of me WHY you would bother encrypting a HSV value – why make the colour-change of a lamp secure? Then I remembered the ‘Zappers’ or whatever the correct Dutch name is (Ik spreek een kleine beetje Nederlands maar het is heel slecht) but these kids used universal remote control to harass people by changing TV channel from the street. Could it be Phillips are thinking of this. Pity – an Android utility that makes light-shows (maybe using audio our data) would be SO COOL. Hello! I just stumbled upon your blog and happy about it. I have a Living Colors Gen 2 lamp which I bought in 2011 approximately. Up until two years ago I was able to use it until it stopped responding to the remote control. I have changed batteries, tried touching all buttons, nothing. The lamp seems fine, when I plug it in it lights up to the last color it was at before it stopped responding to the remote. It was very frustrating. I would like to know if I buy this remote, would you be able to confirm that it will work with my Gen 2 lamp? As far as i know the round ones are all Gen2 / ZLL. Previous Previous post: Philips adds new models to LivingColors product line.